The 7TCE features a specially formulated thermoplastic elastomer (TPE) jacket and cross-linked XLPE insulation that can withstand high temperatures up to 105°C. Photo courtesy of Lapp Group USA. FLORHAM PARK, N.J.–Lapp Group USA has introduced its ÖLFLEX® SERVO 7TCE, a highly flexible, oil-resistant servo cable with TC-ER approval. 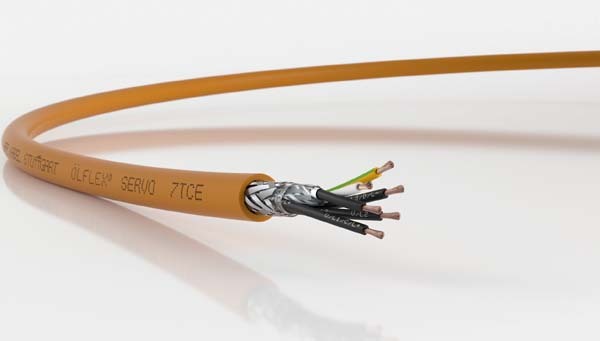 Because it is suitable for use directly on industrial machines and in cable trays, the new cable eliminates the need for two different kinds of cable or the use of conduit in run, the company said in a press release. Offering a rugged design for harsh environments, the 7TCE features a specially formulated thermoplastic elastomer (TPE) jacket and cross-linked XLPE insulation that can withstand high temperatures up to 105°C. In addition to being UV- and oil-resistant, the 7TCE is flame retardant and can resist harsh cleaning solutions. The cable's low-capacitance design is said to enable long-distance runs with limited losses in current and voltage. Nominal voltages are 600V (UL TC-ER) and 1,000V (UL Flexible Motor Supply), with a minimum bend radius of 6 x cable diameter. The 7TCE passed all cold and crush impact tests and is compliant with North American and European standards, including UL TC-ER, c(UL) CIC, CE and RoHS. Lapp Group USA (www.lappusa.com) recommends the 7TCE for motor connections between servo controllers and motors on industrial machines; as well as for tray applications, moving machine parts, assembly handling, and integrated production systems.